There is a beast that lives deep inside of me. Beast is quiet most of the time. Beast is insidious and knows how to creep, cat like from the depths of my mind to the surface of today’s reality. I have locked him away so many times and thrown away the key. And yet, no matter how secure his cage, he always manages to escape. But not with a bang or a growl but with a quiet cat’s paw, sinister silence. Right now, the Beast is on the prowl. I feel him flexing his claws and I feel his hot breath on the nape of my neck. He is hungry. He is ravished. He wants to devour my mind and soul and to end me. Mark Sutton and I invite you to our Conquering Depression Seminar Saturday, Nov. 17th. Here is a link to our new Youtube Channel for Hope Again. You can register for the seminar at this link. I’m facing major surgery on December 4th. That’s just three days short of the anniversary of the infamous attack on Pearl Harbor in 1941. Whenever this time of year approaches, I jump into full Christmas mode beginning on November 1. But, this year will be different. Christmas celebration for us will be dialed back a bit. So, I have already put up our “Homecoming Tree”. It is not yet decorated and sits in our living room waiting for its mantle of shiny decorations. This year, Sherry has decided to dig out all of our vintage Precious Moments decorations. Some of these date back 40 years! Decorating the tree will be quite nostalgic! I guess it is fitting that this is the year I release my novelization of “The Homecoming Tree”, a play I wrote and directed at Brookwood Baptist Church in 2005. In looking back through my photographs of that play, I found one of my father. Sean, my son, took those photos on black and white film and when we developed them, yes, developed them — not digital, the developing process left artifacts on the photographs. These artifacts resembled what you would see on a genuine old film. Here is the photograph of my father as he is looking up at the set for the play. I work in the darkness. I am a radiologist and in order to view the diagnostic images on my monitors, I must keep the room dark. I am surrounded continually by shadows. It is my world. For the past few months, those shadows have slowly, inexorably moved into my world outside of work. They have slowly and quietly slipped along the floor and the walls and the ceiling with cold tendrils of blackness. The shadows have embraced me. When I am strong; when I am attentive to the moving of God in my life, my mind, and my soul; when I pay attention to that still, small Voice; when I am seated at the foot of the cross the Light presses back the shadows. But, when I am weak; when I am troubled; when my attention is captured by the immediate and the urgent instead of the important I am distracted. I fail to look over my shoulder at the creeping darkness. I take my eyes off the Source of Life for my every breath. Three Years Ago, the Laughter Ended! It was January, 1992 and I was lost and alone in Los Angeles. In looking for the hospital hosting my radiology meeting I had somehow ended up in East L.A. a most unsavory and dangerous place. In the days before GPS, I had to rely on a map and somewhere I had made a wrong turn. I said a silent prayer for safety and slowly made my way through the prostitutes and drug dealers converging on my vehicle. God was with me that day and I made it safely out of that area of the city and found my destination. At the end of the meeting that evening, I hit the interstate and headed back toward my hotel on the grounds of Disneyland. There, I would be safe and protected from the harsh world of reality I left behind. There, I would find magic. And, I desperately needed some magic in my life. Hope Again: A 30 Day Plan for Conquering Depression is available for a limited time only on Kindle for only 99 cents. You can find it at this link. And, you can go to our website, conqueringdepression.com, to order LifeFilters. Start off the new year by conquering your depression before it conquers you! I was wandering through Barnes & Noble about four weeks ago. I stood in the Christian fiction section and recalled a time when my first two books sat on the shelf along with books by authors such as Tosca Lee and Ted Dekker. For a moment, I imagined myself as a bestselling author whose books would stay on the shelf for more than a few weeks before they would wind up in the $3 pile at Half Price Books. I was pretty down. Depressed. Discouraged. I wrote about this in my last post and made a decision to back off from writing. Something happened that day. Something that would change everything for me. But, first, let me take a moment to share one of my personal philosophies. My inspiration for writing comes from God. Period. No contest. No argument. And, I have discovered that I can very easily wander off the path God has chosen for me and get all wrapped up in the dream of being Ted Dekker or Tosca Lee or any of my favorite Christian writers. And, then, God humbles me. Over. And over. And over. And, in the humbling I stop and remind myself what I have chosen to ask God every morning when I wake up. It is simply, “God, what is the one thing you want me to do today as part of your work for my life. Let me know what that thing is and not waver from the purpose you have for my life.” Wandering away from God’s purpose for my life is what got me into so much trouble 20 years ago when I descended into a horrific and paralyzing depression. (See conqueringdepression.com for more on that!). Back to the book store. I have always maintained there is no experience you can reproduce online that rivals that of wandering through a bookstore. Surrounded by the look, the feel, and, yes, the smell of books can’t be replicated on the keyboard and screen. It’s impossible to wander aimlessly through Amazon’s almost infinite collection of “books”. And that is why, in my dreary mood that day, I paid a visit to my local bookstore chain. It was the first time in months and now I stood forlorn and depressed in the section where my four fiction books should have been featured along with others written by Christian authors who have a story to tell to the world. And, I asked myself if it had all been an empty dream; a squandered opportunity because I wanted to be published for my own satisfaction, not to fulfill God’s work in my life. I turned away from the fiction and glanced at a small, turquoise book on the top shelf behind me. “Switch On Your Brain” by Caroline Leaf. I don’t know about you, but sometimes when I see a book there is a quality, an instantaneous attraction to it that defies human explanation. I glanced away and then looked at it again. It called to me. I picked up the book and read the back. Something about it clicked. I now know this was a divine appointment. I didn’t see it at the time. I added it to my small pile of books and checked out. I placed the book on my desk along with three other books I had purchased on improving my writing. This past weekend, while on call for my radiology practice, I picked up the “Switch on Your Brain” book and decided to read the first chapter. An hour later, I was halfway through the book. What happened that afternoon was like someone pushing over the first domino. You see, about a dozen things happened in one week that had nothing to do with each other when viewed separately. 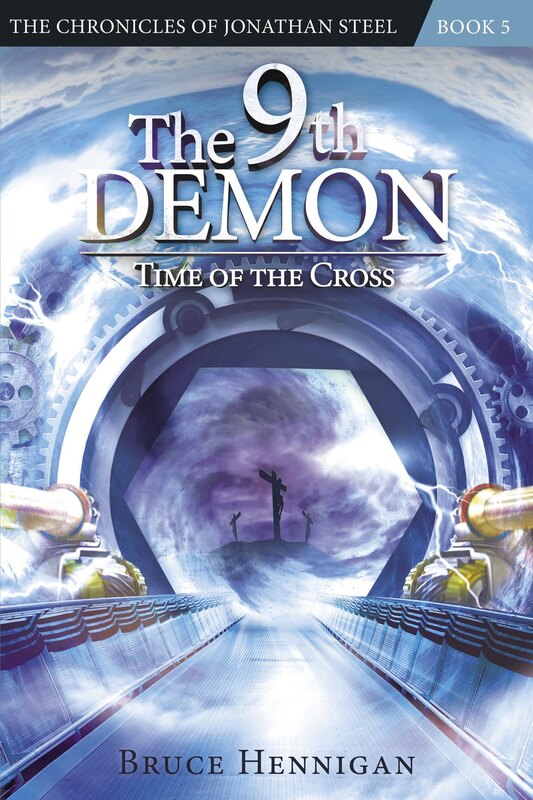 But, putting them together I began to see an undeniable push toward a complete rewrite of “The 9th Demon: A Wicked Numinosity”. Suddenly, information and ideas fell into my lap. Ideas circling in my brain actually gelled. And, three different separate conversations with people about totally unrelated subjects suddenly converged into the final conclusion that I HAD to write this book! Monday night of this past week, I shared all of this with my wife, Sherry. She is my anchor, my reality check. After I laid out all of the “coincidences” of the past month, she nodded in agreement. “Yes, you need to write again.” Today, I started over with the book and it is coming fast and furious. And, the central theme of this book is so timely! I hope to share more with you in the coming weeks. But, right now, I have to write! Here I go! So, I have an idea. Here in the ArkLaTex about six years ago we had an event featuring local authors. I’d like to consider something like that again. If you are a local Christian writer, would you like to have a weekend event where we get together and have some presentations about publishing, marketing, editing, etc.? Would you like to have a venue where you could feature and sell your books? It’s just an idea, right now. But, if you are interested or if you know someone who might be interested, drop me an email or a comment. I’ve heard these words before. Usually, they come from a total stranger through an email or a letter; someone who has picked up “Hope Again” and the LifeFilters and found them an answer to a desperate prayer for help. Let me be honest. I NEVER take such a statement lightly. Every time someone expresses this to me or to Mark Sutton, I am equally shocked and humbled. This past Sunday, I shared a story with my family at our annual Hennigan Family Christmas Party. I won’t detail the story. Just know that the point of that story was to share with my family how a seemingly painful and potentially fatal encounter in my childhood served as the source for something I did later in life that had a profound influence on the lives of others. In this case, four veterans of World War II and an elderly woman who had lived in bitterness for years because of anger over losing her brother in the attack on Pearl Harbor. In both cases, a simple scene in one of my plays echoing that event in my childhood had the unexpected consequence of bringing these people profound peace and reconciliation.